As regular readers of my blog will know, I am in favour of a knowledge-rich education which is based around academic disciplines rather than generic skills. Although I think that generic skills exist and are worthwhile, I do not think they can be taught in isolation, nor do I think that they serve as good curriculum design tools. I have never written a blog post on my views about the whole-school curriculum, primarily because I simply do not feel that I know enough about other disciplines to know what is appropriate. As far as I’m concerned, only philosopher kings and Enlightenment polymaths are qualified to be curriculum senior managers. Reading Tom Sherrington’s collation of curricula, however, made me decide to write this post, not least because I think it sets out some of my broader views on education that I do not always share on my blog. Something like what I have set out below underpins what I think a whole-school curriculum should be like, and I hope it serves as a useful discussion point. Here’s the breakdown of subjects. 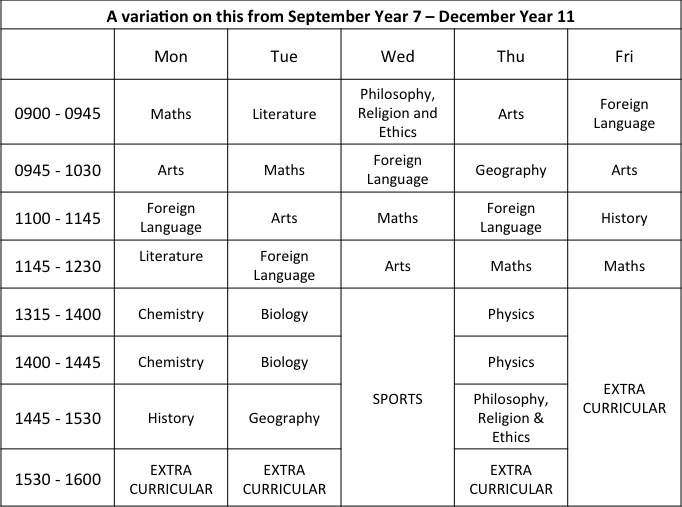 Note that this would be for all pupils up to December of Year 11 (yes, really – see below for why). Mathematics – I have not given maths much more time than it currently gets in some schools (based on Tom’s spreadsheet) but I have given it a daily place in the timetable, based on the idea that it is sensible to do a little and often. Languages – As with mathematics, I think this needs to be little and often, and sustained from Year 2 up to Year 11. Although I can see the attraction of offering Mandarin or Arabic, I think it makes sense – at least at secondary school – to focus on the languages of our closest and largest neighbours, so I would offer French, German or Spanish. Which particular languages would depend on what primaries were offering. As with mathematics, I have put this in for a daily slot for five years. This probably gives scope for schools to offer two languages for able linguists. Sciences – I once told a scientist friend that it’s shocking that discrete academic disciplines, such as history and geography, get collapsed into one another. She (quite rightly) said this was also true of the sciences. I am persuaded by this, and so I would treat the three main scientific disciplines as separate subjects, and give each a double lesson each week. 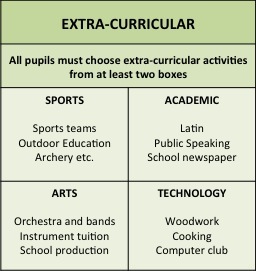 Extra-curricular – this is embedded in the curriculum and is an entitlement for all students. All students are expected to do at least two activities from different areas (see below). Friday afternoon is given over to extra-curricular activities, not least because this helps with things like school trips and outdoor education. English Language – I have completely removed this from my curriculum. I was convinced by Daisy Christodoulou (herself an English teacher) at a recent symposium that (in true Hirschian style) the best way to get better at reading and writing is to learn more knowledge. In the current lingo, that means that literacy teaching should be distributed across the curriculum (particularly the humanities) and it is the job of all literacy-heavy subjects to be correcting spelling and grammar and improving pupil written style. English Literature – I am treating this as a humanity, placing it alongside history, geography and PRE. Vocational education – space here prevents me writing out my views on this completely. Suffice it to say that I think vocational education is vitally important, but that secondary school is not the time to do it. I shall write on this more fully in a future blog. ICT – you will notice that I have scrapped it. This is a curriculum based around academic disciplines and not skills; skills (and I’m including programming as a skill) are taught in discipline-specific ways in appropriate subjects. Citizenship – is not an academic discipline, and I am not convinced it can be taught. The knowledge that responsible citizens require, however, can be taught, particularly in the humanities. This is where my curriculum is not just traditional, but radical. The current trend in schools is to start sitting GCSE exams earlier and earlier. I think this is a huge mistake. What we actually want to be doing is pushing Key Stage 3 later and later. In my dream school, pupils follow Key Stage 3 to Christmas of Year 11. They study all their subjects until then. In December of Year 11, they choose eight of those subjects in which they want to be examined. 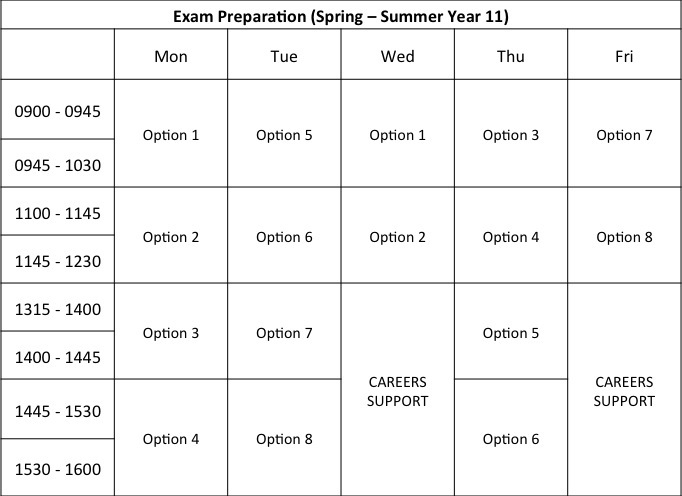 Spring and summer term is then spent working on exam technique, looking at past papers and revising. The point is that teachers will need to ensure that all pupils are at a stage by Christmas of Year 11 where they could take the GCSE exam. Removing a focus on public examinations until right at the end of school would help alleviate (though cannot remove) the problems of teaching to the test. Percentage of pupils who pass a functional numeracy and literacy test. This test can be taken at any time from Year 7 to Year 11 (when they are ready), and is just pass/fail. Schools should aim for 100% pass. Pupils can retake this test until they pass it, rather like a driving test. Percentage of children who pass eight GCSE exams. Again, the expectation should be 100%, and the pass mark set so that it is not completely trivial. Percentage of pupils who are NEETs (not in education, employment of training) six months after the end of Year 11. (1) Where is the critical thinking? Despite the impression I might give in some of my posts, I am in favour of critical thinking. I think, however, that critical thinking happens within subject domains: what it means to prove something, for example, is different in mathematics, chemistry and history. I do think pupils should get the opportunity to compare explicitly the different ways disciplines operate at a meta level, but one cannot compare what ‘evidence’ is in biology versus history unless one has encountered that idea in those subjects first. I would expect my Philosophy, Religion and Ethics subject to contain a course on epistemology, probably in Year 10 or Year 11. Rubbish (with a few caveats). Knowledge of the wonderful world in which we live is an entitlement for everyone. I accept that there are a small number of pupils with severe disabilities for whom this curriculum is not suitable, which is why we have special schools. My curriculum model also allows for setting where this is important. I tend to think, however, that ‘not very academically able’ should in fact be replaced with the words ‘does not yet know…’ (have I just come out in favour of a Growth Mindset???) and it seems unjust and perverse to deprive pupils of knowledge just because they have not learnt enough by the end of Year 6 or Year 9. (3) Philosophy, religion and ethics? This is not a great time to be writing about this, though my bias is towards a secular education system where we do not learn to be religious, but rather learn about religion and religions. I appreciate that there are significant arguments against this position, though I think the model I propose here is sufficiently flexible to allow (for example) faith schools to exist. (4) Why a daily slot for the arts? (5) Why so much time for extra-curricular activities? For the same reason as above – access to extra-curricular activities should not be the preserve of parental choice. A block of time on Friday afternoon would allow schools to share some teachers (say for Latin or Astronomy). Some of those extra-curricular slots could also be used for interventions and additional tuition. I was convinced by Heather’s blog on the benefits of shorter lessons (I know many independent schools have even shorter lessons). Where I thought that subjects might want more time in one go (for experiments in the sciences and in sports) then I would arrange these as doubles. I’d be fascinated by comments on all of this – I know that few state schools will be offering a curriculum like this anytime soon, but I think it is important to give ourselves gold standards to work towards, not least because they help us work out what we think about the aims of an education. Writing this post has certainly helped me clear up my thoughts on this. Much to like about this Michael. I agree with you about a number of aspects collapsing English language – for the same reason you describe. However, the biggest thing I approve of is ensuring students keep working on all their subjects and gaining a grounded education in all their subjects. This gives them time to mature in all subjects and choose in an informed session. It also chimes with some research I read from Swedish schools on how all such choices are significantly socially-influenced – so the later the age students have a broad education, the less socially-dictated are the choices (and so the more socially just the results). One problem that jumps out is accountability – if it’s just about what % pass 8 GCSES then some schools will just focus on getting students over the “pass line” rather than pushing them on to bigger and better things. I agree – any ideas on how this could be better? Make it Grade C? Glad you liked my shorter lessons point. 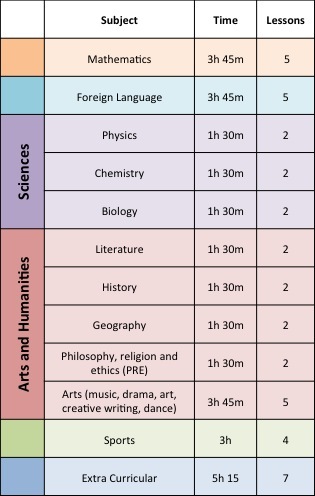 I’m really taken with the idea of choosing which subjects to continue with in year 11. I think you might need lessons on SPAG in the earlier years as many would come still needing formal teaching in these areas but agree with your main point re English Language. Plenty of great food for thought. A lot of interesting ideas here; but I don’t think there ius much here that is not included in the International Baccalaureate. I think there is need to have specific classes in critical thinking/theory of knowledge – my experience as a teacher is that if you expect general skills to be taught in all subjects, they are likely to be taught in none (much teaching is ensuring that students pass specific exams). The Use of English Paper was a great idea; but only laster a few years. Thanks for commenting Stephen – much appreciated. I do like the prescribed breadth of the IB. Regarding critical thinking, I agree with Bailin et al (bit.ly/1qzpxMC) who argue that critical thinking happens within subject domains. I see philosophy as a ‘meta’ domain and one worth teaching (which is why it’s in my curriculum) and, as said, I would certainly include theories of knowledge in that. On proof, I’m not convinced this is the same in all subjects, not least because it is tied so closely to the idea of evidence. Excuse some probable errors in this next bit, but as I understand it in mathematics proofs are necessarily true – either they are tautologies, they can be shown to be true in all cases or to deny the proof results in contradiction. In the natural sciences, proof tends to be based on a process of statistical induction, where something is understood to be true within certain degrees of confidence. In history (as in the law) something is proved by a reliance on testimony and memory, meaning that all truths are subject to a judgement about what would constitute ‘reasonable doubt’. An interesting post which I find neither exciting or depressing, not sure whether that makes me a Tradgressive or a Progitional. As always when I read what for me are interesting posts, I am left with more questions than I had to start with. My first point goes to the heart of the debate about skills to me and was covered above by Stephen. I would be interested to see your reasoning for the “proof is different” idea. Stephen has explained his concern which is also mione. “Knowledge of the wonderful world in which we live is an entitlement for everyone.” One could perhaps have made the same justifcation for slavery, which surely for many slaves gave them a mucher broader experience of the world in exchange for removing their entitlement to freedom. If we are going to deprive a child of their liberty for 8 hours a day and fine parents if they do not enforce attendance at school, I believe we have to ensure that the “entitlement” is not simply and entitlement to what you regard as an essential knowledge. Maybe be should enforce attendance at church and eforce christianity on the basis that such a faith is best for the masses, they just don’t realise it yet. Without wishing to get involved in another Daisy C type myth or not myth debate (as I feel this simply wastes time and energy), I have to say that I have honestly never met a teacher who is not in favour of a knowledge rich education. However, just as strongly as you feel that neither the kids nor their parents should be able to choose the content of extra curricular activities, I feel that to remove all input from parents and kids is more an imprisonment that an entitlement. This is only my gut feeling, but having taught for 20 years in a range of contexts, I cannot see you curriculum working well, at least from the perspectives of kids, parents and probably employers. In an age gone by when you could coerce kids to sit and listen and work in rows without speaking while you talk at them and get the to recite knowledge and then move onto the next class. I imagine sitting in a classroom experiencing it is almost as boring as it was for me to type it. Those days are gone. The state pays for the education you are designing and the state wants some payback. Despite the fact that a number of teachers hate the idea, the world really is a different place to that in which I was educated. It is quite possible that in the near future much of what kids learn will not be studied in school. I think we see the world differently. I see the world as full of unreasonable men who try to change the world to the way they want it, and from this comes true contentment. I believe you see the world as full of reasonable people, and you are trying to change them to fit the world as it was in the 19th century. I don’t believe you will succeed and I don’t believe you have the moral authority to succeed. If you can point me in the direction of reading that might change my view (I have already read much of Hirsch, Daisy C and R Peal), please tell me. I am keen to learn. Thanks for a really nice post. Many thanks for reading, and for leaving such a detailed comment. There is so much here that I cannot hope to respond fully in this reply. I shall try to respond to what I think are the key points. I’ll start at the end with readings – apologies if you have already read these. I must admit that, while I find Hirsch, Daisy and Peal interesting in terms of what they challenge, I do not think they necessarily are the best advocates – at least in their writing – for a liberal education. Hirsch, for example, bases his curricular choices on newspaper articles (as indicative of high culture), which for me is not particularly rigorous. Instead, I would go in two directions. From the view of the sociology of knowledge – and in particular the social justice agenda – I am a big fan of Michael Young. His book ‘Bringing Knowledge Back In’ is a good starting point, particularly in terms of how he distinguishes between ‘powerful knowledge’ and ‘experience’. In terms of philosophy, I find Peters and Hirst good on the curriculum, though I think Alasdair MacIntyre’s work on tradition (which he distinguishes from dogma – a tradition must contain “continuities of conflict”) is a powerful justification for why academic disciplines – which are, if you like, critical traditions of knowledge production, are a strong basis for a curriculum model. Now for a little foray into political philosophy. Living in a liberal democracy is fantastic, but it does not imply that we have absolute freedoms. I do not, for example, have freedom to break the law. I am not allowed to breach my contract of employment, and I am not free to decide not to pay my mortgage yet still keep my house, nor am I free to opt out of taxes. For better or worse, living in a society implies a social contract in which we sacrifice some freedoms in order to gain others. Pick your ethical framework (virtue, deontological, utilitarian) – all can, I think, be used to justify temporarily limiting the freedoms of young people so that they are able to gain an education. We can debate the aims and purpose of that education (which is really where most arguments rest) but I think most will accept that an education is an entitlement and a right (indeed, it’s counted by the UN as a human right), and to achieve universal education, we have to (with all the best intentions) limit the freedoms of children. I am comfortable with that, in the same way as I am comfortable paying taxes, fulfilling my contracts and not breaking the law. On parental choice, I do not see this as limited in the model I offer. I do – for example – provide choices within extra-curricular activities, and of course there is absolutely nothing wrong with parents then choosing to do whatever they wish with their children after 4pm and at weekends. My curriculum model provides ample scope for parental and child freedoms. On pedagogy – there is nothing about my model which implies that children should spend their lessons reciting and parroting, nor does it have to be taught by rote learning (though I think there is a strong case for committing things to memory). Indeed, it is my commitment to the idea that knowledge should be meaningful and connected that gives me my emphasis on academic disciplines. These provide the frameworks in which individual bits of information become connected into the complicated and connected webs that constitute knowledge. Disciplines help us determine good questions from bad questions. Disciplines tell us what constitutes a good answer to a question. Disciplines provide us with the very tools that make critical thinking possible. I think that interdisciplinary work is vital in future knowledge production, but interdisciplinary work is predicated on the existence of disciplines; the latter are logically prior to the former. On the changing world – it really is not that different now to twenty years ago, or even a thousand years ago. The basic principles of mathematics have not changed, and neither have the basic grammatical structures of the languages. Oxygen has not changed its atomic structure, and it interacts with carbon as it has done since nearly the beginning of time. The structure of the human body has not changed. The movement of planets, the mechanism of photosynthesis, the impact of the Black Death, the relationship between the radius and circumference of a circle: these are not irrelevant things in the 21st century any more than they were in the 19th. We face new social challenges of course – but the academic disciplines provide us with tools for understanding these problems. We are, if you like, walking backwards into tomorrow, heading into the future, but making sense of that future using what we have gained from the past. Education, in this sense, is about situating oneself in that trajectory – I think Alasdair MacIntyre is good on this in his book After Virtue. I, for one, would be keen that my taxes are spent on getting my children, and those of my fellow citizens, placed into this great tradition of human achievement. I hadn’t seen this, but really like it. I do think there’s a debate to be had about the deconstructed teaching and practice of grammar. I think that might be missing in the other subjects, no matter how carefully the mapping of it is, and I think it’s important all the way through to 16. That’s a defence of a very small proportion of the English Language course. Nonetheless, I’m persuaded on almost all points, and found myself nodding a lot to your first reply in the comments. Thanks for taking the time to comment – much appreciated. I am increasingly persuaded of your point here about the explicit teaching of grammar and syntax, and I’m going to write a new post that incorporates this. Sitting here writing this in a Swiss school which already has some of the elements that you describe, including shorter lessons, and more liberal bias right up until 19yrs of age. So there is a precedent that shows it can work. I think you raise very valid issues here about many of the things that we take for granted within the British system(s) but which are in fact assumptions and by no means ‘givens’. As a teacher of Critical Thinking, I do think that teaching some of its skills descretely would be a good thing, though it would not necessarily have to be within a subject of that name. I’d agree with Stuart that grammar ought to be taught as a discrete subject at least once a week (and I’d probably jettison creative writing in favour of formal rhetoric) but other than that I’m happy to endorse your proposals. And I’m an English teacher. If you ever plan to set up a free school, I’d love to take part. Any thoughts on how you would structure the content of the subject areas? Chronological, cross-referenced across subject areas, what you’d include/exclude? Can you elaborate a bit further here? Do you mean how I’d structure knowledge within each subject? I have a number of ideas about how I’d do this in history (see here: https://clioetcetera.com/category/knowledge-and-curriculum/) but I couldn’t do it for other disciplines as I’m not an expert, either in the discipline or how that discipline becomes manifest in a classroom subject. In fact I think a ‘working out’ of the curriculum – deriving the subject from its discipline – is probably one of the most challenging and important things for a teacher to do, as I wrote in this post: http://wp.me/p3JKe3-4t. I’d just like to put a word in for the arts here. You seem so keen that 5 arts are represented that it leaves ‘the main ones’ relegated. 45 minutes for art or music will give you just enough time to get everything out and then put it away again. If your intent was to have them as practical lessons then they will need more time than that. Currently (in Tom Sherrington’s ‘home’ curriculum model) I have 1 or 1 1/2 hours per week with each KS3 class for music. Art has slightly more. With 45 minutes you could do a singing lesson or a music appreciation lesson but that would be VERY old fashioned. I’ve never been wholly convinced of drama’s place in the curriculum and dance could go nicely into all the time designated for sport. At least you could put the Arts down as a big loser in your curriculum model? Finally, your extra-curricular model seems to imply that there is a different group of children in each of the Sports/Music/Academic/Tech mould. In my experience the same children will be good at all and there will be fights between Sport and Music (at least that will be traditional) at the very least. Having separate nights would alleviate that somewhat perhaps. Thanks for taking the time to comment. You are of course correct here – some of the arts are losers in my model and I should have made that clearer. The main issue here (as ever) is what gets taken out to make more time for the arts? I wonder if the extra-curricular time could be more structured so as (for example) to insist that all pupils do at least one art? Liberal democracy: You’re right that living in a liberal democracy doesn’t imply absolute freedoms. However, a liberal democracy does start from the assumption that individuals do have absolute liberty unless it involves infringing the liberty of others; in short, there has to be a damn good reason to curtail anyone’s liberty. I understand and agree with the principle of compulsory education but within that there is, and should be, considerable flexibility. An education system in which all children are taught exactly the same is a dangerous thing. Parental choice: It’s important to bear in mind that under UK law, parents are responsible for ensuring that their child gets an education suitable to their age, aptitude, ability and any special educational needs they might have. The law implies an education tailored to the individual. The extent of the tailoring is a moot point, but the principles of accountability of schools to parents (and the community if the school is publicly funded) and individual suitability of the education taking into account not only ability, but aptitude (ie what the child is good at) are clear. The reasons are pretty obvious when you think about it; parents aren’t always good at parenting but the state tends to be worse, and if an education isn’t suitable for the individual, the individual won’t get a good education. Disciplines: I understand your focus on academic disciplines in that they provide a rigorous framework for knowledge, but the disciplines themselves developed as knowledge became more extensive and specialisation was required. Although to an extent inevitable, separate subject areas in schools create artificial fault lines between knowledge that is, at its core, inextricably interconnected. I think there are very good reasons not to teach subjects as separate until children have a good grasp of how the subject areas are interconnected – which could be done at primary level. The reason I asked earlier about a chronological interdisciplinary approach is because of this inherent interconnectedness. I’ve written elsewhere about the power of using the history of the universe as the narrative spine for a curriculum with my own children. It made sense of everything in a way that separate subject areas don’t. Tackling all subjects strictly chronologically isn’t always feasible of course, but there’s no reason why literature, music, art, dance, drama etc couldn’t be cross-linked to history for example. Incidentally, I’m mystified as to why you don’t consider the arts as academic disciplines; there are entire university departments devoted to them.